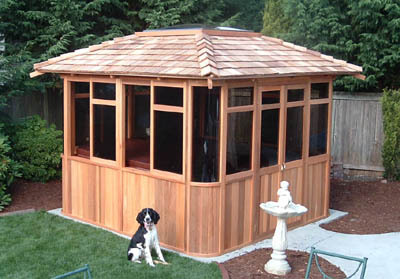 Pacific 10'x10' is our most popular size of full enclosured spa gazebo. It fits mid-size spas ranging up to 8 ft x 8 ft, and still provide space for comfortable spa access, changes and recreations. Regardless of weather, you will enjoy the privacy of your spa time and relax without distraction. 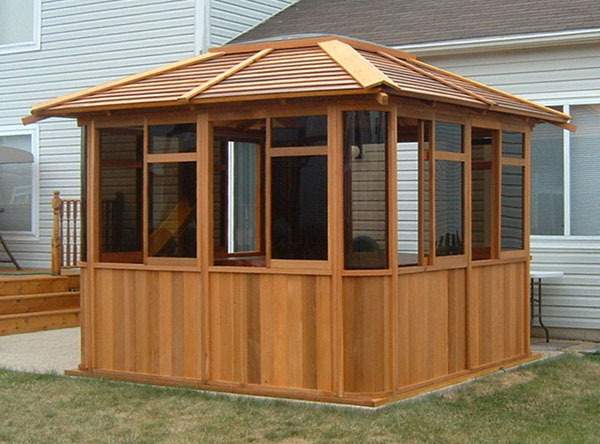 This gazebo will beautify any backyard or landscape and become a center of outdoor party. When you rest in our Spa Enclosures, you will feel so peaceful. It not only protects your spa hot tub (most spa covers need to be replaced in about 3 years after exposed to weather), but also regulates the temperature of your spa (our gazebos can increase your spa room temperature by at least 3 degree in winter and more if insulation measures added). Wall: the wall base is 3 ft high with Tongue & Groove cedar skirt; above is 4 ft high bronze acrylic glass windows section. Windows: include sliding windows with aluminum track and fixed windows all glazed with tinted acrylic glass. Doors: two hinged doors create a opening about 4 ft wide and 7 ft high. The hinged doors are easy to operate. Corners: four rounded corner windows made with un-breakable tinted lexan plexi-glass that create luxurious view. - cedar shingles (#2 graded cedar shingles or shakes). Skylight: 4' x 4' bronze sky dome made with aircraft grade acrylic and UV protection property. 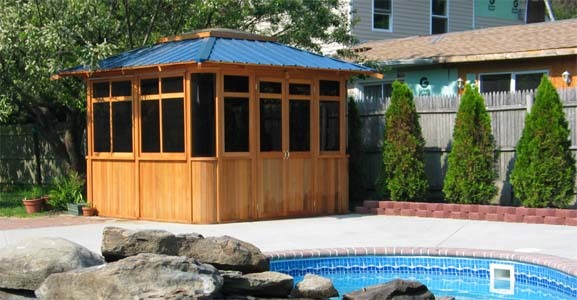 Wall Dimension: outside 120"x120", inside 113"x113"
Metal Wood Roof: Brown, Green or Blue color choices. Solid cedar wood roof: depends on availability. Cedar Shingle Roof: shingles are supplied to be installed on site by customer. ** Limited to direct truck line area in most Continental states of USA and Canada.